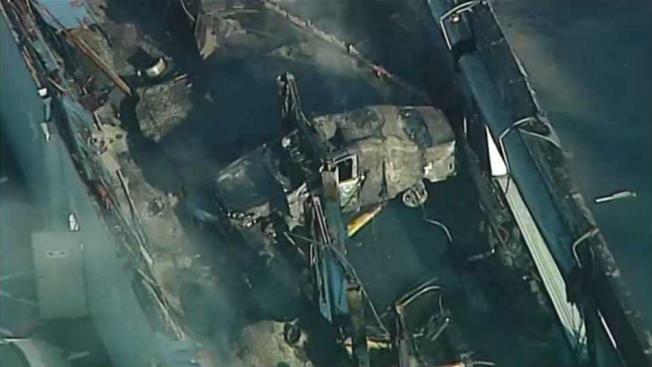 A fire ignited at a car dealership in Santa Clara Tuesday morning, engulfing a portion of the dealership's service area and pumping thick, black smoke above the South Bay city. Bob Redell reports. A fire ignited at a car dealership in Santa Clara Tuesday morning, engulfing a portion of the dealership's service area and pumping thick, black smoke above the South Bay city. No injuries were reported, Santa Clara Fire Chief Bill Kelly said, but at least two vehicles in the service area at the AutoNation Acura of Stevens Creek car dealership were destroyed by the blaze, which also wiped out a portion of the structure's roof. The fire at 4747 Stevens Creek Blvd. was reported around 6:20 a.m., Kelly said. Arriving firefighters encountered heavy smoke and initially went inside to fight the flames, but they later retreated to a defensive position to douse the flames from the ground and from extended ladders. It is not yet clear exactly how many cars were inside the service area at the time of the fire. Thanks to "aggressive firefighting" and a wall running through the middle of the structure that caught fire, crews were able to keep the blaze from spreading to other service areas and the dealership's sales area, Kelly said. Firefighters do not know at this time what sparked the blaze. An investigation is ongoing.